where the component of the kinetic energy tensor is associated to the ordered (streaming) motions (motion tensor) and the term to the random motions (dispersion tensor). We note that the trace of the tensor : is the total kinetic energy. which is the known Scalar Virial theorem. In both cases the Virial theorem describes the (time average) global properties of the stellar system and does not apply to any subsystem. The kinetic energy of the system is where is the mean-square velocity of the particles [demonstrate the formula using Lagrange's mean value theorem]. where rg is some characteristic gravitational radius. if is also constant for the family of galaxies. [But is that true?] We shall return to this very important relation, which goes under the names of Faber and Jackson for ellipticals, and of Tully and Fisher for spirals (in this case the central velocity dispersion is replaced with the maximum velocity). 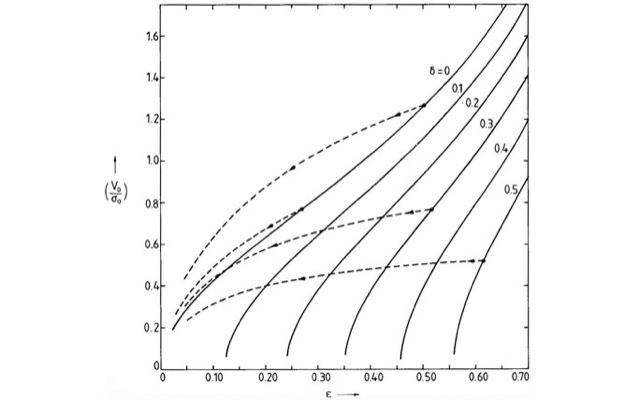 where , since the rotation is assumed about the axis and For density distributions which are constant on similar and homocentric spheroids, the ratio depends only on the axis ratio of the spheroid. Suppose we have an oblate and anisotropic rotator. where is the total mass and the mean rotation squared. Thus, from the observations of and ellipticities ( depends on flattening) we can infer if a galaxy is rotationally supported or dispersion supported. Combining equation (10) with (11), we obtain the dashed curves in the figure, showing the dependence of ellipticity on the parameter which measures the balance between the ordered and random motions; from Eq. (9). Solid lines are labeled by the anisotropy parameter value, dashed lines show the variation of model points when the inclination of the z-axis changes from edge-on (i = 90°) to face-on (i = 0°) view. We see that the effect of the inclination is to make all the anisotropic systems to mimic the case of isotropy. Credit: Binney and Tremaine, Galactic Dynamics, Princeton Univ. Press. The left panel (a) of the figure (after Davies et al. 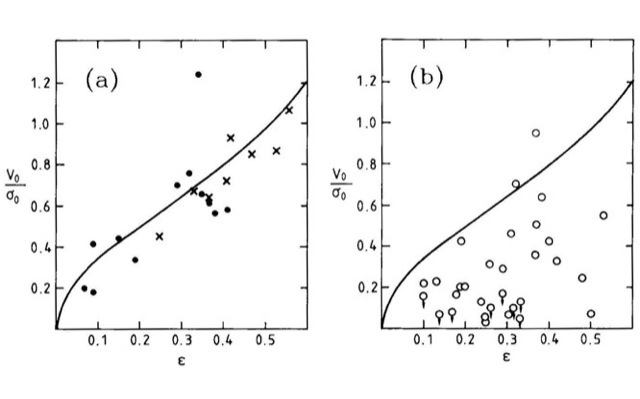 1983) shows the position, in the plane, of elliptical galaxies (dots) and spheroids (crosses) with luminosities The same plot is shown in the right panel (b) but for ellipticals with We note that less luminous galaxies are generally isotropic, while more luminous systems fill the region of the plot where inclined anisotropic systems are expected. See text. From Davies et al., Ap.J., 266, 41, 1983. Let us now make some simple applications of the Jeans theorem. There is a difference between the local circular velocity, (the Local Standard of Rest), and the mean rotation velocity, of the stellar population of our Galaxy at any given distance from the center. This velocity difference, is called asymmetric drift and is a consequence of the fact that part of the gravitational pull is balanced by the random motions of the stars, rather than only rotation. The empirical expression found for is: where km/s. We assume a stationary ( ) symmetric disk and use the first of the cylindrical Jeans equations. having divided for and for symmetry about the equatorial plane. where we have used the definition of in equation (1). The other derivative is more problematic and depends on the orientation of the velocity ellipsoid. We can mention the two most extreme cases. A second one is when the velocity ellipsoid is aligned with the spherical axes thus we have: with the sign covering all the possible orientation around the equatorial plane. where, again, for the stationary assumption, and the second and fourth terms can also be neglected. We have seen in fact that these are unlikely to be larger than which is a factor smaller than the third and fifth terms. If we can measure the density as a function of the height and the mean-square vertical velocity of any population of stars in the solar neighborhood, it is possible to derive the local mass density via Eq. (5). Unfortunately the uncertainties in such estimate are large because it relies on a triple differentiation in the star counts. Oort (1932, 1965) was first to make an estimation of He obtained which is still called the Oort limit in his honor. For more accurate estimates see, e.g., Binney and Tremaine, 1987, Galactic Dynamics, Princeton Univ. Press, pp. 200-201.
to determine the mass distribution of spherical systems. In this equation all the spatial quantities are written in spatial coordinates, while observations are projected on the plane of the sky. Similarly, the measured velocity moments are only available along the line-of-sight, while in principle Eq. (6) contains the information of the full 3-D velocity space. Thus it must be solved only after having “de-projected” the observed quantities. This procedure has two complications. One is physical, i.e. we need to make assumptions on the internal structure of the orbital distribution (while the spherical geometry is simple to handle and provides also a unique de-projection). The other one is technical, as observations are noisy and the de-projection contains the derivative of the measured quantities, which amplifies the noise [why? ], making the result quite uncertain. Let us start by writing the equations which connect the projected observed quantities and their de-projections. 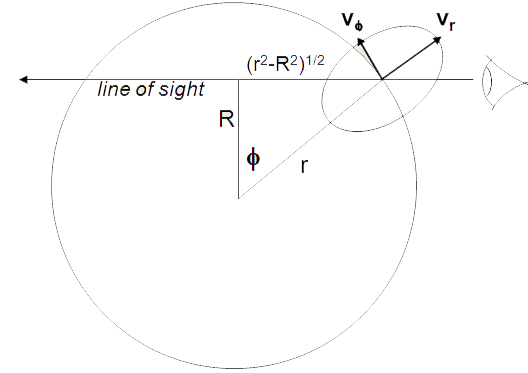 Geometry involved in the projection along the line-of-sight for the spherical systems. Note that, due to the geometry, the two azimuthal angles are interchangeable. The two azimuthal angles ? and ? are interchangeable.